The Terre Francescane Frantoio extra virgin olive oil is obtained exclusively from the best Frantoio variety olives from Umbria, carefully selected by Tiziano Scacaroni. This medium-intense oil has strong notes of artichoke, arugula, tomato and herbs. Makes an excellent dipping oil for fresh bread or drizzled over bean soups, grilled vegetables and meats. Situated just outside Spoleto and the nearby medieval town of Campello sul Clitunno, CUFROL was founded by some of the oldest olive mills in the central Italian region of Umbria and is led by the Gradassi family together with Tiziano Scacaroni. Founded in 1998, CUFROL created a central bottling and storage area, not only for its own Gradassi olive mill, but also for all of the local olive mills, many of whom own minority shares in the company. 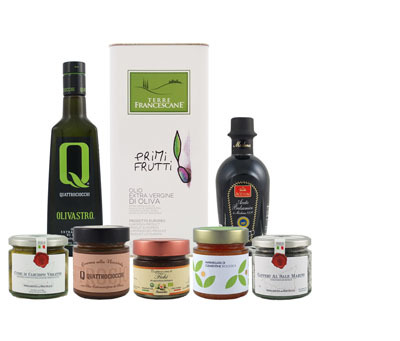 CUFROL's specific focus is to encourage traditional and organic farming methods and to highlight the qualities of a genuine Italian product created exclusively with olives grown, harvested and extracted in Italy. A well-balanced oil pressed from a blend of Calabrian olives. Pressed from organically farmed Koroneiki olives of Western Crete.